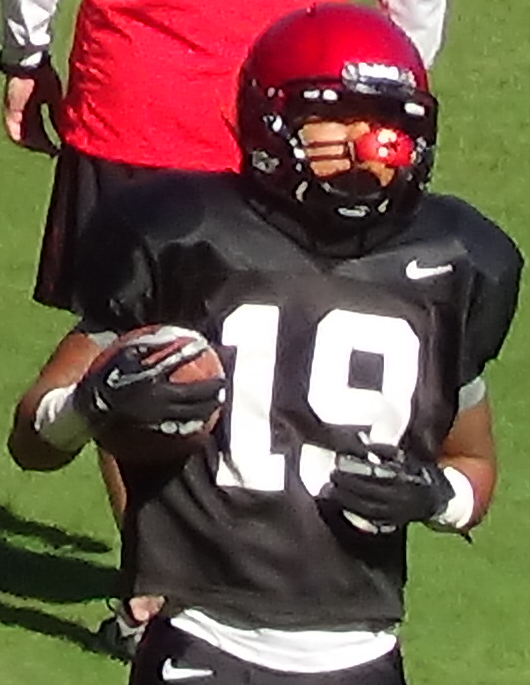 Will freshman RB Donnel Pumphrey (#19) be SDSU's new leading rusher? LAS CRUCES, N.M. (09/28/2013) Trailing 16-5 at halftime, the San Diego State Aztecs (1-3) rallied with 21 unanswered points in the second half to put away the New Mexico State Aggies (0-5) 26-16 on Saturday night. Freshman running back Donnel Pumphrey had a breakout performance rushing for a career-high 167 yards and three touchdowns. "I think he did a nice job running the ball," said SDSU head coach Rocky Long. "He got out on the open field, and he's fast enough that he can outrun some people." After the Aggie defense forced a three and out on the Aztecs' opening drive, senior quarterback Andrew McDonald found sophomore receiver Joshua Bowen for the first score of the game. The Aggies got the ball back, but had to settle for a 28-yard field goal by junior kicker Maxwell Johnson. That gave them a 10-0 lead to end the first quarter. After recovering a fumbled snap by SDSU, the Aggies scored again off another McDonald pass, this time to Dean Andrew for 15 yards. The ensuing extra point was blocked and returned to the other end zone by cornerback David Lamar for two points. The Aggies led 16-2 with 12:52 left in the half. Aztecs' senior kicker Wes Feer nailed a 25-yard field goal to make it 16-5 going into halftime. The second half was the Donnel Pumphrey show. The true freshman from Las Vegas ran in all three Aztec touchdowns (12, 2, and 43 yards) that helped put the game away. "It's nice to win a game," said Long. "I've been coaching long enough to know that there's no such thing as an ugly win, because they are too hard to come by." The Aztecs will have a short week as they return to Qualcomm Stadium to host a Friday game against the Nevada Wolfpack (3-2) . The game will be televised on ESPN with kickoff scheduled for 6:00 p.m. pacific time.